Trees are impressive objects of nature responsible for providing oxygen to the environment as well as adding value to the surrounding landscape. Trees provider shelter to animals and birds. Importantly, trees also enhance the appearance of your property. Proper tree care is critical to ensuring the health of your trees and making sure that they enhance your space. Part of this maintenance is appropriate tree lopping by a qualified arborist. Professionals who conduct Logan tree lopping can achieve numerous benefits for the tree itself, the space where the tree is planted, and the tree owner too. One of the key reasons why you should hire professional tree services is the potential to improve the overall appearance of your property. Landscaping companies usually follow a particular theme, which in turn determines the appearance of your garden. Unfortunately, trees don’t always fit such themes. This is why tree pruning is so important: to trim the tree so that it fits the desired look of your garden. When a tree is struck by lightening, often much of the tree remains. In such an instance, tree lopping is your best hope for keeping the tree alive. Arborists can remove the part of the tree that has been damaged by lightning to prevent disease from entering the wound and killing the tree. This can also promote new growth in the tree. Sometimes, however, the storm damage might be so severe that complete tree removal becomes the only option. A Logan tree lopping expert can assist you with this. If you allow the branches of a tree in your yard to grow unchecked, you might be allowing a safety hazard on your property. Overgrown or dead branches pose a significant safety hazard to you, your loved ones, and even your house. Tree pruning is your best bet when it comes to reducing the size of unbalanced branches to avoid any dangerous incidents. Outdoor spaces should have a mix of both tall and short trees. To allow enough sunlight to pass through and reach the shorter trees and even your lawn, you will need to reduce the canopy. Importantly, not everyone is qualified to handle this task. It is important that you contact a licensed professional to handle this dangerous task in order to improve the appearance and health of all your trees. Tree lopping is important for getting rid of dead, dying, or diseased parts of your trees to promote regrowth. Leaving diseased, dying, or dead branches uncut can be harmful to the entire tree since it can start decaying slowly. It is harmful not only to the tree but also to the people or properties in its proximity. A qualified arborist can assess the health of your trees, and determine what pruning is necessary to promote the health of your trees. In summary, tree maintenance is necessary and important for reasons of safety, tree health, and aesthetics. It should always be done the correct way to prevent doing more harm than good to the tree and its surroundings. Incorrect tree lopping could pose a serious safety hazard to you, your loved ones, and your property and could ultimately lead to the demise of the tree. If you would like to enjoy the benefits of tree lopping, you need to get in touch with a professional Logan tree lopping service. The company should have mostly positive reviews online and should have the equipment, skills, and experience to do the job the right way and as quickly and efficiently as possible. 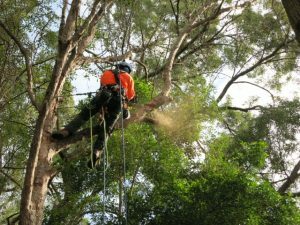 Aussie Tree Care employs qualified arborists to undertake all Logan tree lopping activities. We are experienced at tree pruning and tree removals, and our arborists are fully ensured to complete this work. We also understand the requirements for trees to meet Logan City Council’s regulations. Your trees are in the best hands with Aussie Tree Care. For a free quote, contact 1300873300.